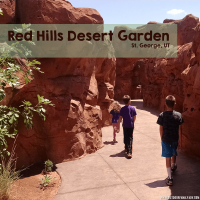 Red Reef Trail is a hike made for taking the kids. Tucked behind the Red Cliffs campground you will find wandering streams and gorgeous red rock. 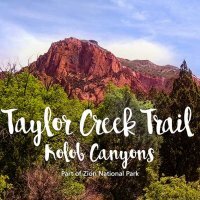 This is a popular hike in southern Utah and yet, 20 years after I first arrived, this was the first time I traveled the Red Reef Trail. A must visit when hiking with kids. The Red Reef Trail has 3 segments which offer hiking of different difficulty levels. 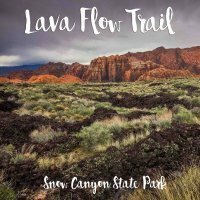 The most popular segment of the trail (and the one we’re reviewing) starts behind the Red Cliffs campground. Reed Reef Trail follows the Quail Creek drainage out of the camping area and then enters a winding red rock canyon. 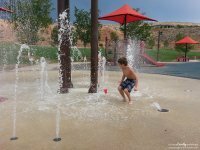 There are many different areas along the trail allowing for you to break and play in the water. Be sure to plan enough time to take pictures! The nature on this trail is very fun with great spots to have the kids pose for pictures. I’m in love with this tree! The Reed Reef Trail is mostly sand with compacted dirt and there are few areas where you will cross the stream. Make sure to prepare for wet feet (or more!). The trail is very easy with some hill climbs. My 6 year old did not need any help for the entire trail. Our friend brought her 4 year old which only needed assistance in a few areas. We also hiked with a 4 month old babe and saw many parents carrying babies and slow walking toddlers. 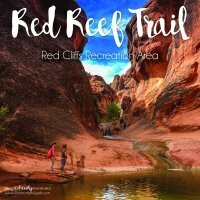 Red Reef Trail is great for hiking with all ages! The picture below is the first area along the Red Reef Trail where you can stop to play in the water. Many of the people hiking this day came fully prepared for swimming. Children hiked in water shoes and wore bathing suits the entire trail. I love that this trail is easy enough that children looking to play in the water can hike in swim clothes without any trouble! It makes for a fun family adventure. We chose to continue on the trail towards the water fall and canyons. We hiked in the early spring and the water level was higher than other times my friend has hiked the Red Reef Trail. Depending on the season you travel and how much rain the area has received, the water levels could vary greatly. Please be sure to check with ranger as you enter regarding the water levels and if at any time the water flow seems too strong or deep for your hiking group, please turn back. It is better to be safe and visit another day. As you continue on the hike it can be come a bit difficult to decipher which path to take. I believe our troubles were mostly due to the amount of people on the trail the day we went; so many went off the path to play in water. Because of this, it became difficult to tell who was hiking and who was playing. In one particular area there is a small canyon which seems like it ends. If you find yourself in a similar area (and haven’t even gone half a mile) just know that you need to go up the hill overlooking the canyon. Once you have climbed the hill you start getting to the good stuff! See the water marks by the girls in the picture below? Those are steps carved in to the sandstone also called “Moki steps”. These can be a bit tricky for the little ones to navigate. Going up is always easier than coming down. Luckily, if they fall, they are just getting wet. Careful of the water depth! Some areas are deeper than they appear. Up the Moki steps they go! As a point of reference regarding this portion of the trail– the gentleman in the picture below relied on this hiking stick, er…cane?.. and was able to navigate the trail just fine. We saw many senior citizens on this trail and doing very well. After the first set of Moki steps you will cross the water and can continue up another set. The second set of Moki steps scale an eight foot sandstone wall. There is a climbing rope hanging down to assist, however the park does not maintain this rope. The park’s website states to use this at your own risk. Many people also used this spot as a swimming pool and jumping area. Again, the park would like to remind hikers to do so at your own risk. If you are jumping in to the water, please ensure you send a scout in to the water below first–check for depth and debris. The Red Reef Trail continues far past the waterfall. Most families like to stop here and enjoy the water. Below is a map showing the Red Reef Trail in its entirety. It also shows how close the waterfall is to the start of the trail. We went on a warm spring day and the trail was very crowded. There were a lot of families and kids enjoying the sun (which I love!) and plenty of room for us to sit and have a picnic. There were also a lot of dogs on this trail. If you are going to take your dogs, please be considerate of where they relieve themselves. I witnessed many dogs being allowed to urinate in the water just a few feet from where children were playing. Not cool, man. Please keep the animals on a leash and be attentive. Heading back to the car did not disappoint. I think that at times I am in a hurry to get home at the end of a trail and forget that the views are different going the opposite direction. Make sure you look up!! And look for the elephant tree! The Red Reef Trail was an easy 1.7 miles. We spent about an hour on the trail, including our picnic. This trail is very easy with a few places where you must climb up or down some rocks and then again in the Moki steps. You may need to help little legs in both of these areas. 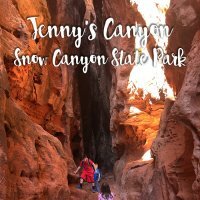 You should feel confident bringing your kids on this hike with you in southern Utah. You can’t lose with climbing, sand and water! And if you’re family needs a bit more hiking, check out the rest of Red Reef Trail beyond the waterfall! Passes Accepted: Interagency Annual, Access, Senior, Volunteer and Military Passes for day use only. Fees collected on-site and placed in envelope for deposit. Do not plan on getting change. Ranger *may* have change. Water: Yes! Plan to get wet! Seasons: Best times to go are in spring and fall. Summer will be hot and water levels may be low. Trail Type: Sand and compacted dirt. Directions: Take Interstate 15 north to Exit 22. At the end of the off-ramp, turn right onto Old Highway 91. Travel south 2 miles and turn right. Continue under two freeway tunnels (tunnels restrict vehicle size to less than 12 feet in height and width) and follow the paved road for 1.3 miles into the campground. Red Cliffs Recreation Area Brochure Available Here.